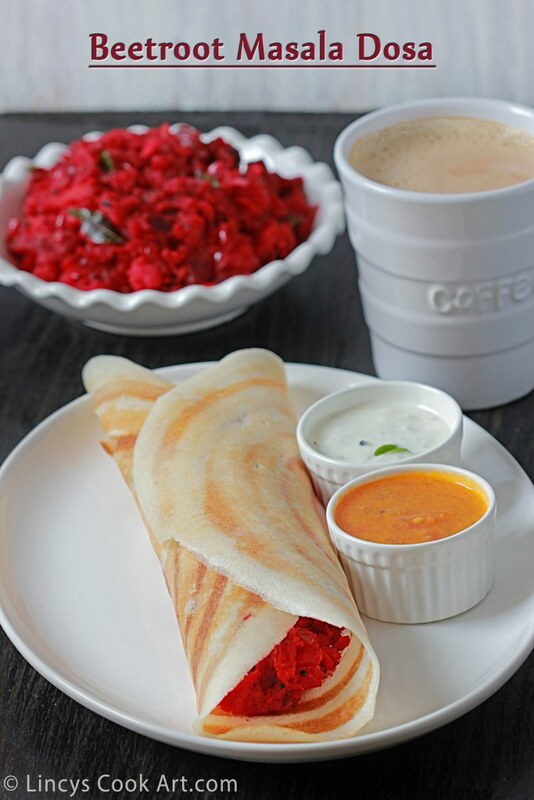 Beetroot Masala Dosa is a Kerala special (Masala) Dosa which is quite popular in the Indian Coffee House (ICH). When i was doing my post graduation, we used to frequent the place, for the Beetroot cutlets, Masala Dosa and coffee. It was a delight whenever we visited. I used to make beetroot cutlets often and when it comes to dosa i hadn't yet tried at home. When I did plan to post the dosa series this idea clicked in my mind and gave it a try. It tastes just yum, like the one i tasted in ICH. My kid loves this masala, as it is colourful and also tasty. I have already posted Pink dosa or Beetroot dosa earlier in my blog.When compare to normal Masala dosa with potatoes i felt this one is more healthy and colourful as it includes 3 veggies in it. A filling breakfast or dinner which could be made in minutes!! Pressure cook the beetroot, potatoes and carrot together till soft for about 3- 4 whistles. Peel them and roughly mash them. If you feel difficult in mashing beet root grate them using carrot grator after cooking. Heat oil in a pan and add the mustard seeds with urad dhal. Once the mustard seeds splutter, add the curry leaves and fry for a second. Now add the chopped onion and green chillies; cook for fifteen seconds. Add the finely chopped ginger and garlic; saute for fifteen seconds. Now add the mashed beetroot potato carrot mixture and turmeric powder, salt and about 1 and half cup of water. Allow the mixture to boil well and cook till the veggies start to become mushy. Cook according to your palatte. Because some do likes to find chunks of potatoes in the masala some like it like mashed consistency; switch off the gas. Heat dosa tawa and grease with oil; add a ladle full of batter and spread with the back of the ladle into concentric circles. Drizzle half a teaspoon of oil; once the batter starts to cook, add big scoop of beetroot potato carrot masala over the dosa and roast the dosa till crispy. Note: Always try to take beetroots in smaller size than potatoes as it requires more cooking time than potatoes. The size of the carrot must be very big as it cooks very fast when compare to potato and beetroot.